Prop Store is proud to present their 2018 Entertainment Memorabilia auction with over 600 rare and iconic treasures from film and television. All lots are currently up in the online catalog for viewing and ready to take absentee bids in anticipation of the live auction that kicks off on Thursday September 20th at Noon UK Time, which is 7AM Eastern Time in North America. Now, more than nineteen years later, the prop hobby and Prop Store are thriving. With over thirty employees between their offices in London and Los Angeles and over 25,000 combined square feet of archived props and costumes, they have become the busiest and most trusted authority in the hobby. Lot 107 is an outstanding feature lot that presents a distressed army rescue costume worn by Chris Evans in Captain America: The First Avenger. Captain America’s costume comprises a blue helmet, a pair of goggles, a leather jacket, webbing, an emblem tunic, a pair of paratrooper trousers, a belt, and a pair each of leather gloves, spats and leather boots. The blue helmet is outfitted with padding and straps for a snug fit, with a white stencilled “A” on the front. Inside the dome are four labels that read “STUNT”, “#2” and “STAGE 2”, and a printed barcode that also reads “FROSTBITE MARVEL 82021” (Frostbite being the production’s working title). The paratrooper goggles feature suede padding and wrap around the helmet with an elastic strap. Visit the online catalog to see the full description and photos. This piece opens for bidding at 20,000 pounds. Lot 463 is one of the most valuable pieces in the auction, expecting to sell for well over a half million. Prop Store is offering Han Solo’s jacket from the Empire Strikes Back. This exact jacket Solo jacket was used for sequences on Cloud City and screen matches numerous shots in the film. Unique identifiers include the placement, sizing and fold lines of the pockets, as well as a specific internal stitch-line within the collar that is visible in a close-up shot of Ford. At least one other jacket was used for filming and the jackets can be differentiated by their pocket placement. Made of a cotton-woollen blend with a polyester satin lining, it features a mandarin collar, pockets on both sides at the chest and waist, a large pocket on the rear, a faux-pocket on the left arm, shoulder panel detailing and visible stitched detailing at the upper arm, elbow and cuffs. It shares several styling and cut details with Luke Skywalker’s (Mark Hamill) jacket worn on Dagobah and in Cloud City, notably the stitched detailing on the arms. In addition to a full description, catalog viewers can also see a video discussing this iconic piece. Prop Store has a rare find hitting the auction block at Lot 525. They have a Superman costume worn by Christopher Reeve. The costume was worn in the first two films, which were shot back-to-back, with the cape reused in the third film. The bespoke costume consists of a tunic, a cape, a pair of trunks, a belt, a pair of leggings and a pair of boots. 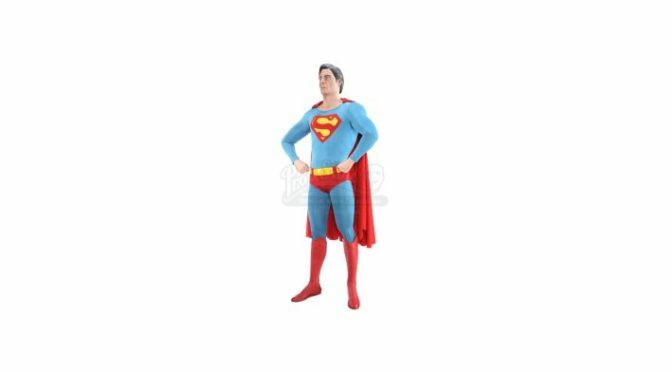 Superman’s instantly recognisable long-sleeve tunic is made of a custom-woven, stretchy blue nylon material manufactured during the production, and displays Superman’s classic “S” logo in red and gold on the chest. The tunic has a hidden zipper at the back, and features a Bermans & Nathans wardrobe label stitched near the neck that reads “CHRISTOPHER REEVE 12312 MUSCLES SUPERMAN”, as it was designed to be worn with a muscle suit. The leggings are made of the same material, and include a wardrobe label that reads “CHRISTOPHER REEVE WATER SUPERMAN” as it was designed to be worn during shots in a water tank. The tunic and the leggings both include holes at the waist, which allowed the actor to be wired for flying scenes. Bidding opens at 30,000 pounds. 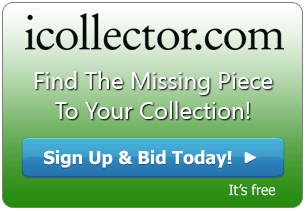 The auction has so many more feature pieces and over 600 lots to view. There are millions of pounds worth of props and memorabilia up for grabs on the auction block. Absentee bidding can be done at anytime leading up to the sale.